The speakers of the Balanta language, the Balanta, call themselves Bijaa (Singular Ajaa) and inhabit a territory that stretches between Senegal and Guinea Bissau (Balantakunda). Balanta-Ganja, which is considered as a distinct language by some researchers and as one of the varieties of Balanta by others, is spoken by approximately 100,000 people in the southern part of the administrative region Sédhiou in the area of Middle Casamance, Senegal, whereas the number of speakers of Balanta-Kentohe, the variety mainly spoken in Guinea Bissau, is estimated at around 370,000 (cf. Ethnologue). According to the classifications by Greenberg and Sapir, the Balanta languages or varieties belong to the Atlantic languages (labelled as West Atlantic by Westermann and Greenberg) of the Niger-Congo phylum, which were further divided into North Atlantic, South Atlantic and the isolate Bijago language by Sapir and Wilson. Even if the issue of the internal differentiation of the Balanta dialect cluster – not to mention that of Atlantic or Niger-Congo) – is far from being resolved, at least its inclusion in the Bak group of languages, alongside the dialect clusters Joola and Mankanya-Manjaku-Pepel is established. Apart from some rare exceptions, there was no comprehensive description of Balanta-Ganja available until recently. 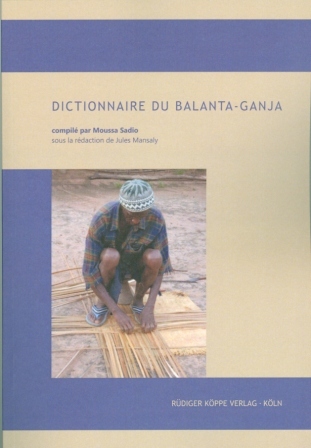 The present dictionary is intended to supplement these recent publica­tions, which are mainly targeted at an academic readership, and addresses both Ganja speakers that look for a reference for verifying the meaning of French terms or the spelling of Ganja words, and those that wish to acquire basic knowledge of Balanta-Ganja as well as anyone who is interested in the language. For the most part, the dictionary contains vocabulary used in the everyday life of the Balanta, but special political, technical and religious terms etc. are also included. In order to illustrate the meaning and the context of usage of the respective lexemes, numerous entries are accompanied by example sentences.